Aqua restaurant in Howth is no stranger to awards and regularly appears on Best Seafood lists, including our own. It would also have to take the top spot for restaurants with a view. Situated at the end of the West Pier, Aqua enjoys a first floor elevation out over the bay so from any seat, in any weather, you can enjoy the stunning views and, if you’re lucky, catch a glimpse of their very own pod of seals. The focus in Aqua is on bringing tourists and locals the best of local ingredients, which helps them to stand out in a restaurant heavy site like Howth. All of the seafood and fish is sourced by their own local team of fishermen and as a result you are guaranteed the freshest and finest produce around. This ethos has also led them to create their own kitchen garden allotment on nearby Howth Head which ensures you are getting the best quality on your plate. A cosy sitting room provides the perfect spot for a pre dinner drink in the old harbour building and a large wraparound balcony is where you can really make the most of the panorama, although it is probably best to do so in Summer. If you can tear your eyes away from the spectacular views you will find a bright, nautical themed dining room, complete with a lobster tank, which always serves to get seafood fans excited. Lunch time was particularly busy for a Tuesday, the crowd a mix of locals and tourists. We were treated to a table right beside the floor to ceiling windows and enjoyed watching the sunshine light up the waves whilst perusing the menu and nibbling on lovely sourdough with a sharp pesto. Lunch is great value at Aqua with two courses for €23.95 and three courses for €28.95. The menu is varied and features a mix of seafood staples with some seasonal surprises for you to try. The Warm Pigeon Salad with Wild Mushrooms & Tarragon Dressing was such a treat. The pigeon was perfectly seared and the result was tender and gamey but not overpoweringly so. The juices from the meat added a great depth of flavour to the light salad dressing and brought the elements together really nicely. Little cubes of beetroot added a nice lift to the dish, it was the perfect way to start our meal. The most exciting starter on the menu was the Cold Steamed Half Lobster in the Shell with Mango & Pineapple Salsa and Aqua’s Garden Salad, and it didn’t disappoint. Presented dramatically with the claw still attached, they really mean it when they say a half lobster. The portion was very generous with lots of delicious meat packed in to the claw. The salsa was fruity and a surprising addition, but one that worked very well. Wanting to sample all the elements on the menu we chose the Spinach-Ricotta Tortellini with Gorgonzola Cream. Lots of little pasta parcels were presented in the dish, which could have been slightly more al dente for me. The sauce was big, bold and sinfully rich, you could smell it approaching from the open kitchen. This is a great dish for warming you up in the Winter but should only be ordered by serious cheese lovers! The fish was the star of the show. A Pan-Fried Fillet of Cod was served Grenoble Style with accompanying boiled potatoes and sugar snap peas. The generous fillet was cooked perfectly, as expected, seasoned well with a crispy top and flaky fish that broke away with the slightest nudge of the fork. The clever addition of crispy croutons and the caper tomatoes added more texture, more seasoning and tasty bursts of flavour. The dish was so considered and well executed, it’s no wonder Aqua is renowned for its seafood. 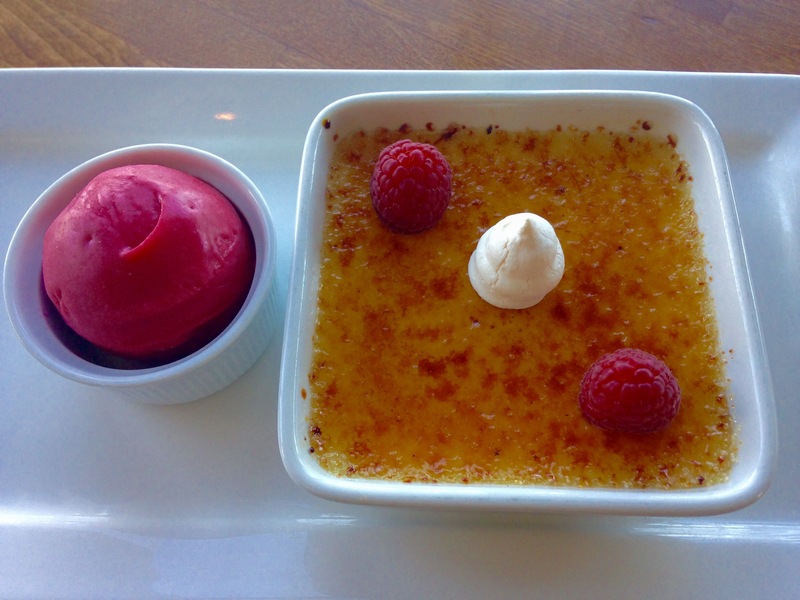 After debating dessert we selected the Classic Crème Brûlée with Baby Meringue, Raspberries & Raspberry Sorbet. The custard was perfectly set, packed full of vanilla and topped off with a cracking caramel top. There was a strong flavour from the raspberry sorbet without being overly tart and nice little meringues present for added sweetness. The creamy fruity combination was deliciously satisfying. The food is wonderful at Aqua and represents great value from such an established restaurant. Since opening its doors on New Year’s Eve 1999, Aqua has become a local institution loved by regulars and tourists alike. If you haven’t sampled the culinary wonders of Howth, Aqua is setting the bar high and is definitely one to experience, for the food and the views. The bill including sparkling water, a tea and a glass of Chablis, Domaine Fevre, France 2014 was €75.80. Aqua is a classic taste you will return to again and again.